It is a new year which means new travel goals. When you are deciding where in the world to visit, it’s fun to learn about new places in the process. No matter your travel goals, it’s worth considering a trip to visit Tibet. Being the average elevation is 4,900 meters (16,000 feet) it’s important to know the best month to visit Tibet. Every country and every place has a certain best time to go — a time when everything is ideal and optimal. You may think July is the best time to visit, given it’s the warmest month on Mt Everest. However, considering all factors, including temperature, attractions entry, travel cost, and weather, April is one of the best months to visit Tibet. While Tibet is a region where each season and every type of weather highlights a different face and beauty of the region, April is the best month to go. In addition, there are additional reasons why April is the best month to travel to Tibet and the Lhasa Buddhist Temples. Since it’s getting a bit warmer, the tourism season is just starting in the late March. Typically, there are discounts. During this time — from February to April — there is no entrance ticket policy. The tour and package promotions are in full swing during these months. As Tibet is an expensive place for travel, it is best to make use of discounts during the month of April. Hotels often give discounts for early bookings during the month of April. You need to be wary of very inexpensive-sounding packages and tours. Some are decent so it’s important to do your homework and research when you are looking for the cheapest Tibet tour. The weather during April suited for a variety of activities. April and March are months very well-suited for climbing Mount Everest and for hiking to or exploring Everest Base Camp. 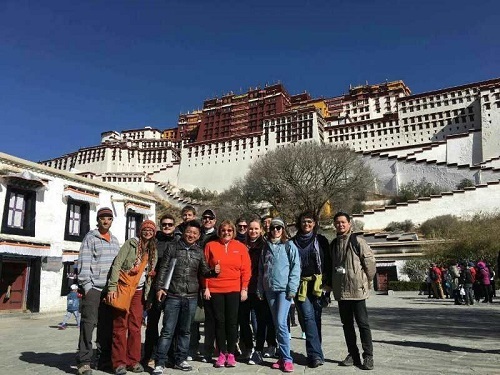 A one week trip from Lhasa to Everest Base Camp — which includes visiting attractions in Lhasa and Shigatse — is one of the most popular trips during April. Many Mt Everest climbing packages are available in the month of April. The skies are clear and so the views are also clearer. You can hike freely in your own pace in the month of April. With proper prior training and exercises for climbing the Everest, the experience is favorable, pleasant, and hassle-free if you climb the Everest in April. You will need the appropriate gear and clothing as the weather will be cold given the elevation. There is also a package that includes EBC and Lake Namtso along with Lhasa. Depending on what you want to see and do, there are many different itineraries to suit your needs. Many package options can be customized to your needs. For sure, discuss it with your tour operators to know more details to find out what makes the most sense logistically. 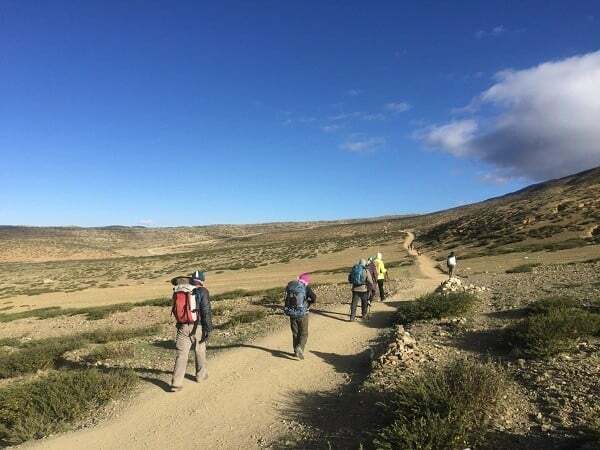 April is a good month for trekking in Tibet. One of the most popular trekking destinations that tourists and pilgrims do is the Mt. Kailash Kora. Mt. Kailash is considered as a holy mountain by people of Buddhist, Bon, Jain, and Hindu faiths. Kora is act of circumambulation around a holy place. Thousands of pilgrims travel to Tibet to perform Kora around Mt. Kailash. Trekking around Mt. Kailash and visiting the nearby, holy Lake Mansarover are some of the most popular activities. It is said that taking a dip in Lake Mansarover absolves a person of their sins from previous and current life. April and May are the best months to do this as summer showers start in June. Another reason to visit Mt. Kailash during April is the Saga Dawa Festival. This festival falls in the middle of April and thousands of locals flock to Mt. Kailash to celebrate this. They erect a huge pole with a lot of prayer flags tied to it. Tourists can also trek around Mt. Kailash for adventure and for a religious experience. There are also five monasteries surrounding the mountain which give a great insight into religion and culture. More than a challenging and adventurous experience, trekking around Mt. Kailash will be an authentic experience that shows you the religious side of Tibet. Peach blossoms bloom all around Tibet from mid- March to mid- April. Since 2002, local Tibetans and tourists have celebrated this beauty of nature to acknowledge the stunning views and promote local region and culture. The flowering phases slightly change depending upon the different region it grows in. In some regions, they bloom until the end of April and in some region only until mid-April. 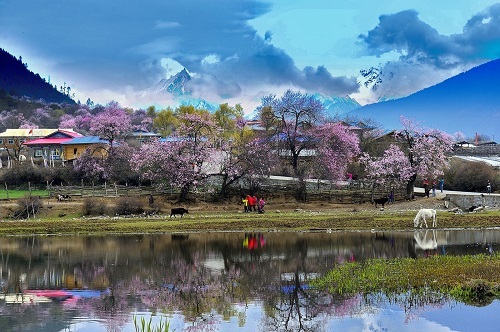 One of the more important Tibet traveling hacks to note is that Tibet is not open to international tourists during the month of March, so travelling to Tibet during early April is the best time to catch the Nyingchi Peach Blossom Festival. From its vantage point, the best month to visit Tibet is April. It’s the month when the weather starts getting warm, the sun starts staying out a little longer, and leaves turn into a new color. The cold weather and snow starts wearing off in the lower regions of the valley and wind is dry. April is the month that is perfect for doing pretty much everything, be it trekking, hiking, cycling, or over-landing. Visit Tibet during April to experience the best of everything.